Success of Eurovision News' UGCVN. Geneva, February 2017: The success of Eurovision News' UGCVN (User Generated Content Verification Network) has resulted in a move from Whatsapp to Slack to better help Eurovision members in their effort to discover, verify and source a broader range of digital and user-generated content from around the web. Slack offers the opportunity to use more themed channels with 13 currently being employed. Over 80 participants from Eurovision News Member stations and the Geneva, Moscow and Washington bureaux are currently collaborating on discovery, verification and clearance of digital and user generated content. The team consists of TV and web member stations journalists and editors, and also Eurovision News producers and editors. 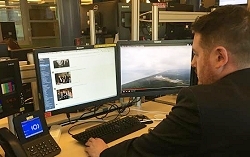 Every morning from Monday to Friday, the Eurovision News team send participants an #outlook, including the daily stories on which they will be working, ranging from hard news to lighter stories. On Slack channels such as #cleared-content, #debunk-fakenews, #ethics-ugc-guidelines, #showcase, #tips-and-tools, and #translation, the UGCVN provides Members with a variety of content, while giving them an opportunity to collaborate and source material together and/or discuss UGC ethics issues, or debunk fake visuals or stories. On the #twitter lists channel, Members can find useful Twitter lists organised by country and/or topic to follow from the account @EVN_Newsroom. In the UGCVN Alerts WhatsApp group, Members get alerts and important advisories in case of breaking news.